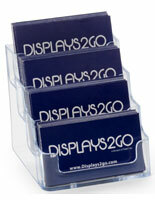 How effective is a multiple business card display in promoting commercial and retail organizations? 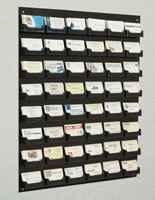 Contact information dispensers are the most basic - and essential - communication tools in a marketing professional's tool kit. Keeping customers and clients connected with the people who helped them is the best way to build a longterm relationship to ensure repeat sales. 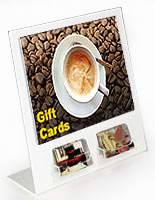 There are, of course, a zillion ways to do that -- so this online store addresses all of them! 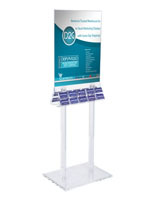 This calling card fixture offers a great "take one" service in professional offices, restaurants, retail showrooms, and also at conventions and trade shows. 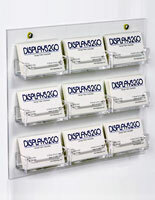 We offer an array of contact information dispensers in a wide variety of sizes, configurations and materials that go seamlessly with any decor. 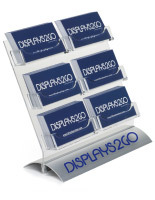 This multiple business card display, also known as quality multi-pocket holder, comes in desktop, wall, and floor mounted styles. For those who wish to dispense credentials to their clients after a one-on-one meeting so they can buy more services or products from you later, a countertop style can be placed right on the desktop where visitors will see it. 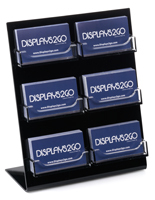 Multiple business card displays that are callingcard dispensers come floor standing for use in large conventional halls, hotel lobbies and auto showrooms. 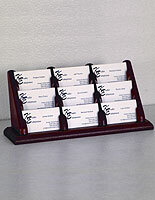 This tall, multi-pocket holder attracts attention from across a room filled with activity and foot traffic. 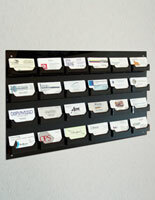 Wall hanging styles free up floor and counter space, and can hold a lot of contacts. 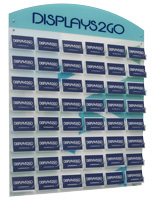 Some of these tiered fixtures with more than one slot for materials are customizable with a company or organizational logo and tagline, supporting the brand subtly by keeping your name in the minds of visitors who deal with you. 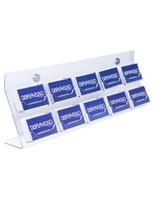 This multi-pocket holder comes in a variety of fabrications to suit the specific budgetary needs and aesthetic preferences of the merchandiser. 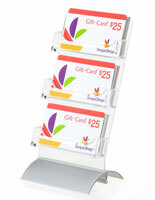 Always remember to order items in bulk to glean the most savings. 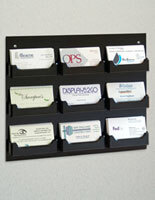 What materials are these multi-pocket holders for calling cards available in? 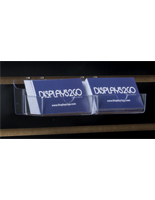 Multiple business card displays in clear or black acrylic draw attention to the credentials being dispensed, are lightweight, and have decidedly modern appeal. 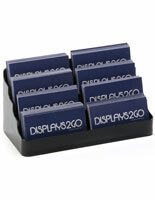 A version with a black backer and clear open compartment also makes a striking visual statement. 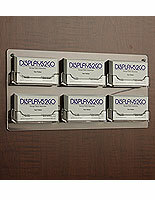 Slatwall styles are also available in this material. 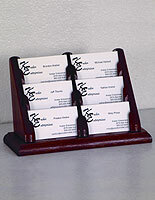 An alternative material for card holders from our economy line is molded plastic. 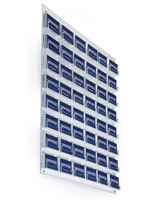 The difference is not really noticeable but for a slight blue tint; this item is also available in black for a sleek look that complements any office or showroom. 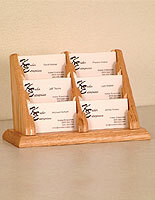 Contact information holders in solid wood make a great presentation for those who favor a more traditional esthetic. 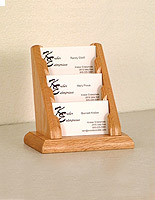 Each of these stands is available in richly finished light oak, medium oak, and red mahogany (countertop versions only). 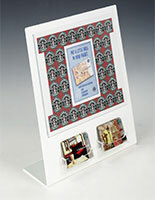 Polycarbonate systems are only used for the wall hanging series. 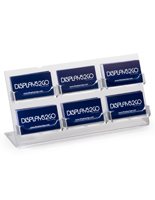 They are particularly durable, and due to their spring-loading design, capable of distributing one card at a time from each filled compartment - store up to 2,800 contacts! Rent compartments out to other organizations for sideline income. 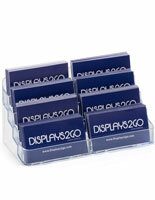 Floor standing units with an acrylic or black MDF base have clear acrylic slots, and one- or double-sided configuration. 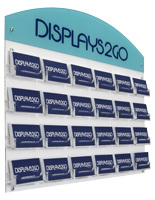 These stands feature a poster over credential dispensers for huge brand-boosting & customer relationship gains. 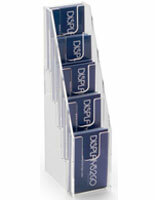 All of these contact dispensing fixtures come in an array of tiers, orientations, and configurations. 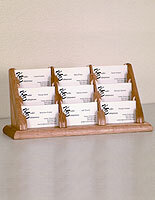 Wall hanging models have up to 48 compartments -- in fact, with that many slots, an organization can "rent" each one out to other enterprises to make sideline revenue. This business card display for countertop can be placed on a desktop so that customers can “take one” after they meet with a professional, to keep in touch later. 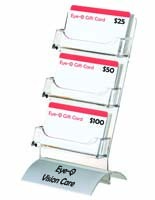 Restaurant owners and boutique owners will place one of these tabletop fixtures near a register to dispense gift certificates and coupons from two compartments. Some of these counter versions have a small sign above the dispenser to further reinforce the brand and goods. 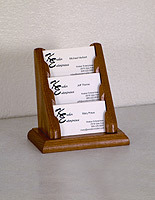 From wood and acrylic, to economy plastic, desktop versions come in all fabrications and configurations. 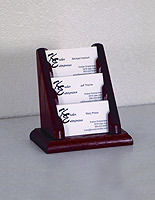 This multiple business card stand that is a contact information dispenser that is also available in wall mounted versions. 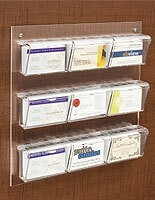 Dispense up to 48 groupings of credentials from one unit and free up foot traffic at the same time. 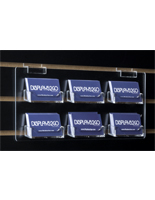 These affordable stands for contacts are made of acrylic with a full color digital header for a printed logo that tells new customers what materials they will find in this rack as soon as they walk in the door. 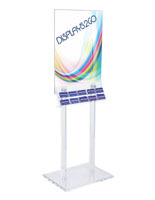 Within this calling card dispenser collection is a floor standing mount with a poster and 10 slots underneath; double-sided versions that hold twice the amount of material for double the advertising exposure. 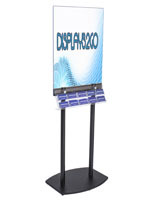 This display is geat for a mall or trade show environment, these tall fixtures come in clear acrylic top to bottom, or clear acrylic on top with black laminate MDF on the bottom. 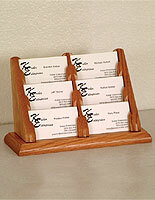 Buy this stand for contact information in bulk to reduce the overall cost. 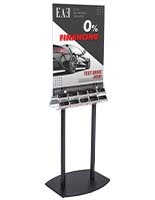 As long as professionals interact with each other, these racks will remain one of the fastest and most effective ways to advertise and build relationships with customers. With so many configurations and styles to choose from, we assure you there is a fixture here that will look perfect on a desktop or wall, or even floor standing at a sales meeting! Boost brand and encourage sales by placing one of these dispensers for credentials in an area of high visitor concentration. Clients and customers can take your contact information with them so that long after they have left your showroom or office they can get in touch. 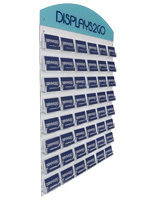 Some businesses will invest in large, wall hanging units where many organizations at once can provide information about their companies from one unit (on some occasions, this can be a great source of extra revenue). 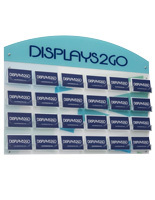 This online store will be your go-to for all things credential, just browse our site and see! Remember that all items at our online store are priced to sell, but bulk orders bring the biggest savings of all. 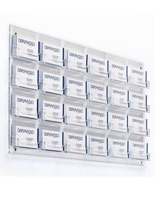 In addition to purchasing quality office fixtures for dispensing organizational information, remember to take advantage of our quick-ship policy on in-stock items!